Remember that your lineage could still be Cherokee Indian, or German, or Japanese or a myriad of other ethnicities. Your mtDNA test only names one lineage out of millions of possible ancestors! I do realize that there's more then West African in my heritage. I mean I can see that looking in the mirror 😉 But I found it interesting that the test came back that way. Perhaps her great great grandfather was Cherokee or part Native Am. I haven't done the what are you DNA test. Since I can't find Clara or Anna before the 1870 census I strongly suspect they were slaves. Although there are tales of moonshining up in the hills so maybe they were up there free and not being counted. But I doubt it. Open to any new information I find though. You are so furtunate to have gotten to ask your grandmother this information & also to have all those sepia photos of her. i dont knwo many people who have that many different pictures of a grandmother. Did you find any articles of her in the Detroit newspapers? Kristin, I just stumbled upon your website while searching for others with the same Mtdna as my maternal grandfather’s mother. Your blog is Fantastic and you are a tribute to your Ancestors. Well done! I have decided to read it from the beginning. Regarding this blog post, a thought immediatly came to me. 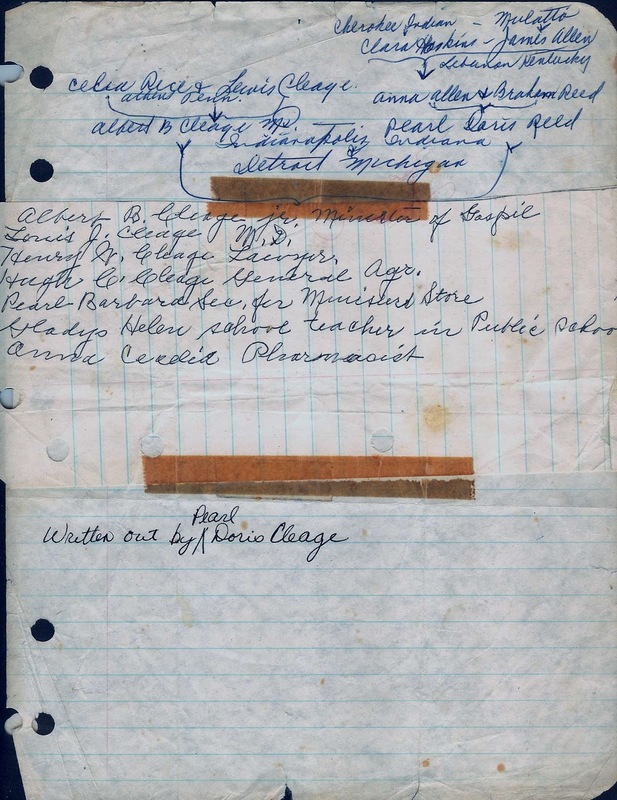 I may be missing something or interperting it wrong but in the handwritten genealogy of your grandmother Pearl I would not expect your Aunt Gladys Mtdna to be Cherokee because… it looks like to me if you follow the arrows Grandmother Pearl was indicating that it is James Allen’s mother who is Cherokee and father is Mulatto. What do you think? Btw, I am new to DNAgenealogy.. does matching mtdna mean with are DNA cousins? Susan, I’m glad you enjoyed my blog. My grandmother was identifying her grandmother, Clara Hoskins as a Cherokee Indian and her partner as mulatto. The arrow pointed to their daughter, Anna. The matching mtdna doesn’t mean we’re dna cousins. Mtdna goes back to the original mother in our ancestry, through the mother’s, grandmother’s etc. It means that both of our fore mothers in that line, came from that particular group. Did you test with 23 and Me? If you did, we’ll show up on each other’s list of cousins.